1917. Volume 1 of a 2 volume set. 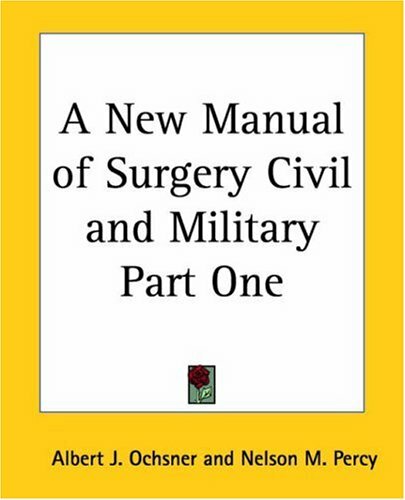 Volume I of this manual is written and illustrated for the man who is compelled, by virtue of the circumstances surrounding him, to do surgery, and who wishes to know what the author would do in a similar case to the one he happens to have under treatment at any given time. A portion of the work deals with clinical cases taken from hospital records and discussed as one discusses such cases in practice. This has been done for the purpose of bringing the actual clinical conditions before the mind of the reader. Contents: Part I. General Surgical Considerations; Part II. Surgery of the Head; Part III. Surgery of the Neck; Part IV. Surgery of the Chest; and Part V. General Surgery of the Abdomen. See other volumes by this author available from Kessinger Publishing. Volume 2 ISBN 0766186369.